WASHINGTON, Jan. 22 (Yonhap) -- North Korea has replaced an envoy handling negotiations with the United States ahead of the second summit between their leaders, an informed source said Tuesday. The new representative is Kim Hyok-chol, who previously served as the first North Korean ambassador to Spain, according to the source privy to North Korea-Spain relations. "It's a mystery to us," the source told Yonhap News Agency on condition of anonymity, referring to the sudden switch of interlocutors. 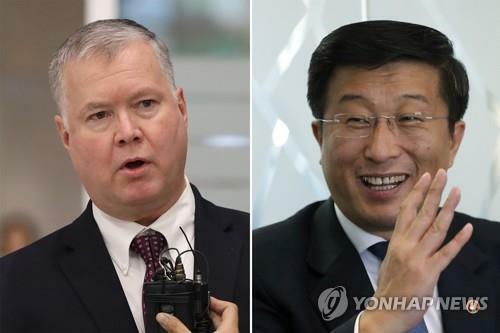 The U.S. special representative for North Korea, Stephen Biegun, was appointed in August to spearhead the negotiations on dismantling Pyongyang's nuclear weapons program. Biegun's counterpart was widely believed to be Vice Foreign Minister Choe Son-hui, a seasoned diplomat who played a key role in preparations for last year's first summit between U.S. President Donald Trump and North Korean leader Kim Jong-un. Biegun and Choe met for the first time in Sweden over the weekend, presumably for talks on the next summit, planned for late February. It's unclear whether Choe still has a role in the bilateral negotiations. She and U.S. Ambassador to the Philippines Sung Kim held several rounds of talks ahead of the Singapore summit in June to produce an accord for their leaders. That agreement committed the North to work toward complete denuclearization of the Korean Peninsula in exchange for security guarantees for the regime. Kim Hyok-chol was ambassador to Spain until 2017, when he was expelled from the country over Pyongyang's nuclear and ballistic missile tests. He was part of the delegation that accompanied Kim Yong-chol, a close aide to the North Korean leader, to Washington last week, which raised speculation he is now in charge of protocol or U.S. relations at the North Korean foreign ministry. The apparent switch from Choe to Kim was revealed Tuesday by U.S. Secretary of State Mike Pompeo, who told the World Economic Forum in Davos that Biegun had the opportunity to meet with his "newly designated counterpart" during Kim Yong-chol's visit to Washington. The two men discussed "some of the complicated issues towards achieving what the two leaders laid out back last June in Singapore," Pompeo said. The White House announced after Kim Yong-chol's meeting with Trump that the second summit will be held near the end of February at a location to be announced at a later date. Vietnam has been reported to be the likely venue.